Not too long ago, someone commented on my blog who’s learning geomancy about what methods can be used for generating the figures. Personally, after getting my bearings with the traditional stick-and-surface method (which I recommend everyone beginning geomancy to use until they get the “feel” of the system down, as if it were a type of initiatory practice on its own), I either use cards or dice. Dice divination, especially, is flexible and polyvalent, and I use it for both geomancy, grammatomancy, and other systems of divination as the need strikes me, and not only are they easy to use, they’re also highly portable and compact as a tool. The issue (well, not “issue” per se) came up in this conversation when the commenter mentioned using an app to generate the Mothers as a whole, or a random number generator to generate numbers with which to reduce into the Mothers. This particular commenter isn’t alone in using an app for this; I know of other geomancers who use apps to generate Mothers, either as whole figures or as numbers for the rows of the figures. A feeling of guilt was mentioned, since the commenter hasn’t read accounts of geomancers using apps or seen videos with such apps being used, but I dismissed that feeling because it’s definitely a thing for some geomancers. Of course, it should be emphasized that it’s only some geomancers who do that, with “some” being the operative word. It’s not a common thing; most geomancers I know use some sort of tools, with few just using raw numbers pulled from some source or other. 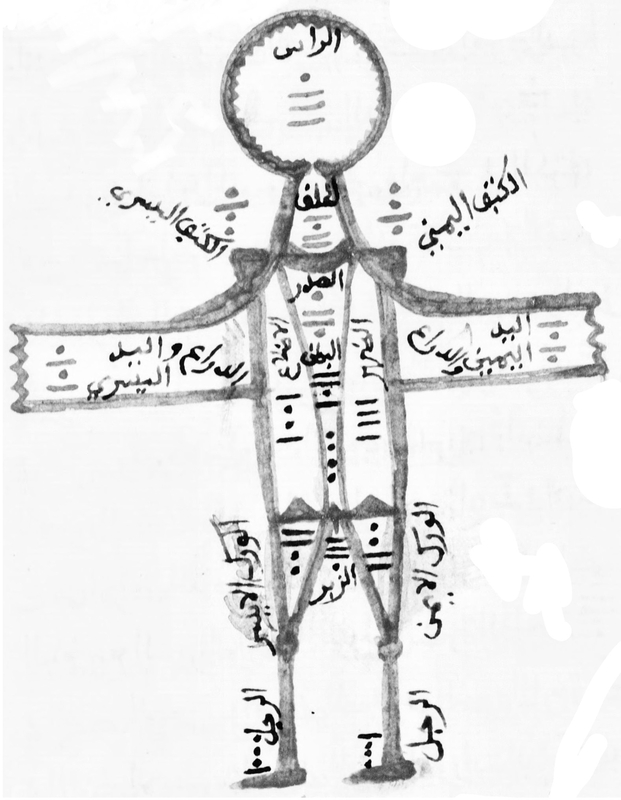 I know it can be a thing for Arabic geomancers to use the Dairah-e-Abdah enumeration of the figures and tell their querents to give them four random numbers from 1 to 16 and using the figures associated with those numbers for the Mothers, but that’s not really a thing in Western geomancy because we don’t really have an equivalent enumeration system for the figures. Instead, when Western geomancers use automatic Mother generators at all, it’s often with dice-rolling apps or similar random number applications. Personally, I don’t like using them. I’m a tangible person, and I prefer tangible tools I can hold, wield, throw, and manipulate with my hands. For me, I am as physical a person as I am a spiritual one; my body is a tool unto itself, and by using my body to interact with physical things, I can just as easily interact with their spiritual counterparts and ethereal symbol-referents. Plus, the use of tools helps me get into the right headspace, that light trance state where I can focus purely on the query and act of divination, which I find is essential to getting good results in my readings. That’s one of the reasons why I can’t exhort new students to use the stick-and-surface method of divination enough, because it helps inculcate the ability to enter that trance state and allows them to tap into it at a moment’s need using any sort of tool or trigger. Is such a state necessary for all diviners? I suppose not, though it certainly doesn’t hurt. I know that I like doing it, and I’ve found that my focus is weakened, my interpretations more vague, my ability to tap into a situation less refined, and my understanding of the symbols in a reading gets a little slower without sufficient mental preparation which, for me, is aided by the manipulation of physical tools. For that reason, I don’t use apps or other tools to generate figures for me, because it doesn’t do anything for me to help with entering that divinatory headspace. Pressing a button and reading figures off a screen, or clicking something and then reducing a bunch of numbers off a web page into dots just…it lacks that connection that I find helpful. When I generate figures, it’s me who’s the one doing that generation; these figures are “falling from my own hand”, so to speak. I have that connection with the figures of the reading that allows me to tap into the reading and swim in its currents, dredging up whatever treasures and traps I can from it. For a similar reason, when someone wants my help with a chart, I don’t just read the chart details they give me; I actually spend the time generating the entire chart from scratch with all the details I need, not only to make sure that the chart was calculated correctly, but also to help me integrate the chart into my own sphere. Even if I’m not in a trance state for that act (after all, the divination was already done by someone else), the mere act of drawing out the Mothers and the entire rest of the chart helps bring those details to life. It’s like reciting a litany of prayers; sure, you could just skip to the end or anywhere in the middle you feel is necessary, but the recitation of the entire process from start to end makes everything more potent once you get there. Plus, as a software engineer, there’s something I’d like to clue you in on. Most random number generators you use tend to actually be what are called pseudorandom number generators, algorithmic methods that approximate true randomness within acceptable boundaries but which aren’t truly random. The reason why pseudorandom generators are used is that, for most purposes, they’re random enough to be useful, and are generally easier to develop and faster to produce output than true random generators. For me, though, I’d rather a true random number generator, which can be harder to find or manipulate. For that, I might recommend the excellent site RANDOM.ORG, which produces truly random results sequences for many purposes. Now, that said, if you find that using an app to generate random (or pseudorandom) Mothers, or numbers for reducing into odd or even rows for the Mothers, works for you, then keep using it! I would still recommend learning a set of tools for geomancy or whatever preferred divination system it is you use, because there may be times you don’t have access to a phone or a computer. Geomancy benefits from this especially in that all you really need is a pen and paper or a stick and some dirt; even if I don’t like the method, it still works, and it can truly be taken anywhere without having to carry tools of various and sundry types that can set off security gates or the paranoid eyes of watchful passers-by. Still, if using an app works for you, don’t fix what ain’t broken. It’s not my preference to use it, but I can’t rightly knock it if it works. A few weeks ago, the good Dr Al Cummins and I were talking about geomantic magic. It’s a sorely understood and understudied aspect of the whole art of geomancy, and though we know geomantic sigils exist, they’re never really used much besides in addition to the usual planetary or talismanic methods of Western magic. While I’ve been focusing much on the techniques of divination, exploring the use of geomancy and geomantic figures in magical workings is something of a long-term, slow-burn, back-burner thing for me. Al, on the other hand, has been jumping headlong into experimenting with using geomancy magically (geomagy? ), which fascinates me, and which gives us nigh-endless stuff to conjecture and experiment with. After all, there’s technically nothing stopping us from seeing the geomantic figures as “units” in and of themselves, not just as extensions of planets projected downward or as combinations of elements projected upwards, so seeing how we could incorporate geomancy into a more fuller body of magic in its own right is something we’re both excited to do. One of these talks involved my use of the geomantic gestures (mudras, or as I prefer to call them, “seals”). I brought up one such example of using a geomantic seal from a few years ago: I was at the tattoo parlor with a magic-sensitive friend of mine in the winter, and it had just started to snow. I had to run across the street to get cash, and I decided that it wasn’t that cold (or that I could bear the weather better) to put on my coat. I was, as it turns out, incorrect, and by the time I got back, I was rather chilled to the bone. So, in an attempt to kickstart the process of warming back up, I threw the seal for Laetitia and intoned my mathetic word for Fire (ΧΙΑΩΧ). My sensitive friend immediately turned and picked up on what I was doing without knowing how. I hadn’t really tried that before, but since I associate Laetitia with being pure fire (according to the elemental rulers/subrulers of the figures), I decided to tap into the element of Fire to warm myself up. Since that point, I use the seals for Laetitia, Rubeus, Albus, and Tristitia as mudras for the elements of Fire, Air, Water, and Earth, respectively, like in my augmentation of the Calling the Sevenths ritual (e.g. in my Q.D.Sh. Ritual to precede other workings or as general energetic/spiritual maintenance). Talking with Al about this, I came to the realization that I instinctively used the figures to access the elements; in other words, although we consider the figures being “constructed” out of the presence or absence of the elements, from a practical standpoint, it’s the opposite way around, where I use the figures as bases from which I reach the power of the elements. 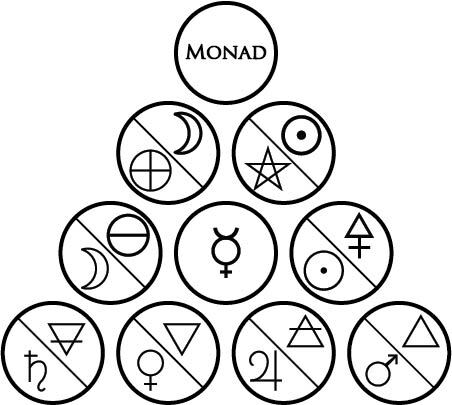 That was interesting on its own, and something for another post and stream of thought, but Al also pointed out something cute: I use the figures of seven points as my seals for the elements. This is mostly just coincidence, or rather a result of using the figures with one active point for representing one of the four elements in a pure expression, but it did trigger a conversation where we talked about arranging the seven planets among the points of the geomantic figures. For instance, having a set of seven planetary talismans, I can use each individually on their own for a single planet, or I can arrange them on an altar for a combined effect. If the seven-pointed figures can be used for the four elements, then it’d be possible to have elemental arrangements of the planets for use in blending planetary and elemental magic. So, that got me thinking: if we were to see the geomantic figures not composed of the presence or absence of elements, but as compositions of the planets where each planet is one of the points within a figure, how might that be accomplished? Obviously, we’d use fiery planets for the points in a figure’s Fire row, airy planets for the Air row, etc., but that’s too broad and vague a direction to follow. How could such a method be constructed? Note how the seven planets occupy the bottom two rungs on the Tetractys. On the bottom rung, we have Mars in the sphaira of Fire, Jupiter in Air, Venus in Water, and Saturn in Earth; these are the four essentially elemental (ouranic) planets. The other three planets (the Sun, the Moon, and Mercury) are on the third rung, with the Sun in the sphaira of Sulfur, the Moon in the sphaira of Salt, and the planet Mercury in the sphaira of the alchemical agent of Mercury. Although we lack one force (Spirit) for a full empyrean set of mathetic forces for a neat one-to-one association between the empyrean forces and the four elements, note how these three planets are linked to the sphairai of the elements: the Sun is connected to both Fire and Air, Mercury to both Air and Water, and the Moon to both Water and Earth. Note how Mars takes the single point in the Fire row, while Jupiter, Venus, and Saturn occupy only one of the points in the other rows; these three empty points will be filled by the three empyrean planets according to the most harmonious element. The Moon can appear in either the Earth or Water rows, and Mercury can appear in either the Water or Air rows, but in the case of the figure Laetitia, the Sun can only appear in the Air row, since the Fire row has only one point and is already associated with Mars; thus, in Laetitia, the Sun goes to Air, Mercury to Water, and the Moon to Earth. Following this rule, we get Rubeus with Jupiter occupying the sole Air point and the Sun moving to the Fire row as the second point, Albus with Venus in the sole Water point and Mercury moving to the Air row, and Tristitia with Saturn in the sole Earth point and the Moon moving to the Water row. With those done, it would then be easy to see what Via would look like as a collection of planets: just the four ouranic planets Mars, Jupiter, Venus, and Saturn in a straight vertical line, the four purely-elemental ouranic planets without any of the mitigating empyrean ones, since the empyrean planets don’t need to be present to mitigate any of the ouranic ones. Leaving aside Populus for the moment, what about the five-pointed and six-pointed figures? In the case of five-pointed figures (e.g. Puer), we have to leave out two of the empyrean planets, and only one in the case of the six-pointed figures (e.g. Fortuna Maior). For these figures, we decided to break with the foregoing empyrean-to-element rule and institute two new ones for these figures. I figured that this departure from the original empyrean-to-elemental-row idea was useful here, since it allows us to emphasize the structure of the figures and respect the natural affinities of the empyrean planets to each other. The Sun and Moon have always been considered a pair unto themselves as the two luminaries; without one, the other shouldn’t necessarily be present in such a planetary arrangement. Thus, for the five-pointed figures that omit the Sun and Moon, we would then use only Mercury, as it’s the only empyrean planet available. Likewise, if either the Sun or Moon is present, the other should also be present; for the six-pointed figures, this means that Mercury is the only empyrean planet omitted. An alternative arrangement could be used where you keep following the prior rules, such that Fortuna Maior uses the Sun and Mercury, Fortuna Minor uses Mercury and the Moon, etc., but I rather like keeping the Sun and Moon both in or out together. It suggests a certain…fixity, as it were, in the six-pointed figures and mutability in the five-pointed figures that fits well with their even/objective/external or odd/subjective/internal meanings. For all the foregoing, I’m torn between seeing whether the order of planets within a row (if there are two) matters or not. In one sense, it shouldn’t matter; I only assigned the ouranic planets to the right point and the empyreal planets to the left because of the right-to-left nature of geomancy, and coming from a set theory point of view, the order of things in a set doesn’t really matter since sets don’t have orders, just magnitude. On the other hand, we typically consider the left-hand side of things to be weaker, more receptive, more distant, or more manifested from the right-hand stronger, emitting, near, or manifesting (due, of course, to handedness in humans with the usual connotations of “dexter” and “sinister”), but relying on that notion, I do feel comfortable putting the empyrean planets (if any) on the left-hand points of a figure, with the ouranic planets on the right-hand side, if not the middle. It’s mostly a matter of arbitrary convention, but it does…I dunno, feel better that way. Note the symmetry here of the planets in the voids of Populus. Above Mercury are the three hot planets (the right-hand side of the Tetractys), and below are the three cold planets (the left-hand side of the Tetractys). 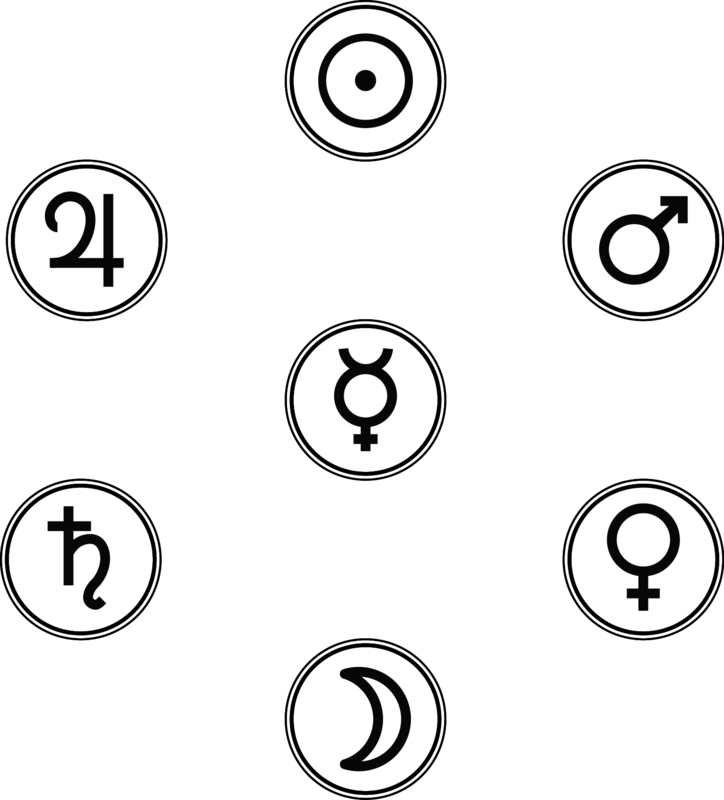 On the right side are Mars and Venus together, representing the masculine and feminine principles through Fire and Water; on the left, Jupiter and Saturn, representing the expansive and contracting principles through Air and Earth; above is the Sun, the purely hot unmanifest force among the planets; below is the Moon, the coldest unmanifest force but closest to manifestation and density; in the middle is Mercury, the mean between them all. Around the planet Mercury in the middle can be formed three axes: the vertical axis for the luminaries, the Jupiter-Venus axis for the benefics, and the Saturn-Mars axis for the malefics. Note how Mercury plays the role of mean as much as on the Tetractys as it does here, played out in two of the three axes (Sun-Moon on the third rung, and Venus-Jupiter by being the one of the third-rung “parents” of the two elemental sphairai on the fourth rung). The Saturn-Mars axis represents a connection that isn’t explicitly present on the Tetractys, but just as the transformation between Air and Water (hot/moist to cold/moist) is mediated by Mercury, so too would Mercury have to mediate the transformation between Fire and Earth (hot/dry to cold/dry); this can be visualized by the Tetractys “looping back” onto itself, as if it were wrapped around a cylinder, where the sphairai of Mars/Fire and Saturn/Earth neighbored each other on opposite sides, linked together by an implicit “negative” Mercury. Further, read counterclockwise, the hexagram here is also related to the notion of astrological sect: the Sun, Jupiter, and Saturn belong to the diurnal sect, while the Moon, Venus, and Mars belong to the nocturnal sect; Saturn, though cold, is given to the diurnal sect of the Sun to mitigate its cold, and Mars, though hot, is given to the nocturnal sect of the Moon to mitigate its heat, with Mercury being adaptable, possesses no inherent sect of its own, but changes whether it rises before or after the Sun. So, the real question then becomes, how might these be used? It goes without saying that these can be used for scrying into, meditating upon, or generally pondering to more deeply explore the connections between the planets and the figures besides the mere correspondence of rulership. Magically, you might consider creating and consecrating a set of seven planetary talismans. Once made, they can be arranged into one of the sixteen geomantic figures according to the patterns above for specific workings; for instance, using the planetary arrangement of Acquisitio using the planetary talismans in a wealth working. If you want to take the view that the figures are “constructed” from the planets much how we construct them from the elements, then this opens up new doors to, say, crafting invocations for the figures or combining the planets into an overall geomantic force. The five-pointed figures omit the Sun and the Moon. These are the two visible principles of activity/positivity and passivity/negativity, taking form in the luminaries of the day and night. These could be set to the right and left, respectively, of the figure to confer the celestial blessing of light onto the figure and guide its power through and between the “posts” of the two luminaries. The six-pointed figures omit the planet Mercury. Magically, Mercury is the arbiter, messenger, and go-between of all things; though the planetary talisman of Mercury would not be needed for the six-pointed figures, his talisman should be set in a place of prominence at the top of the altar away from the figure-arrangement of the rest of the talismans to encourage and direct the flow of power as desired. The only four-pointed figure, Via, omits all three of the empyrean planets. As this figure is already about directed motion, we could arrange these three talismans around the four ouranic planetary talismans in the form of a triangle that contains Via, with the Sun beneath the figure to the right, the Moon beneath the figure to the left, and Mercury above the figure in the middle; alternatively, the figure could be transformed into an arrow, with the talisman of Mercury forming the “tip” and the Sun and Moon forming the “arms” of the arrowpoint, placed either on top of or beneath the figure of Via to direct the power either away or towards the magician. The eight-pointed figure Populus, although containing all seven planets in its arrangement, does so in a “negative” way by having the planets fill the voids between the points proper. Rather than using the planets directly, it’s the silent voids between them that should be the focus of the works using this arrangement. 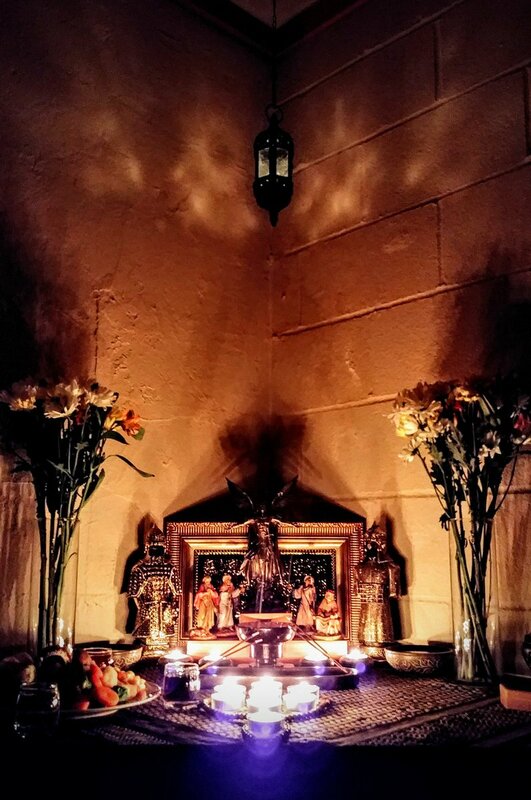 As an example, if we would normally set candles on top of the planetary talismans for the other arrangements, here we would arrange the planetary talismans according to the arrangement for Populus, but set up the candles in the empty voids where the points of Populus would be rather than on top of the talismans themselves. All told, this is definitely something I want to experiment with as I conduct my own experiments with geomantic magic. Even if it’s strictly theoretical without any substantial ritual gains, it still affords some interesting insights that tie back into mathesis for me. Though it probably doesn’t need to be said, I’ll say it here explicitly: this is all very theoretical and hypothetical, with (for now) everything here untested and nothing here used. If you do choose to experiment with it, caveat magus, and YMMV.